(Nanowerk News) A mysterious flash of X-rays has been discovered by NASA's Chandra X-ray Observatory in the deepest X-ray image ever obtained (Monthly Notices of Royal Astronomical Society, "A New, Faint Population of X-ray Transients"). This source likely comes from some sort of destructive event, but it may be of a variety that scientists have never seen before. The X-ray source was originally discovered in October 2014 ("Discovery of a fast X-ray transient in the Chandra Deep Field-South survey") by Bin Luo, a Penn State postdoctoral researcher; Niel Brandt, the Verne M. Willaman Professor of Astronomy and Astrophysics and professor of physics at Penn State; and Franz Bauer, an associate professor of astrophysics at the Pontifical Catholic University of Chile in Santiago, Chile. Luo has since moved from Brandt's group to become a professor of astronomy and space science at Nanjing University in China, and Bauer had been a postdoctoral researcher in Brandt's group from 2000 to 2003. The data were gathered using the Advanced CCD Imaging Spectrometer on Chandra, an instrument conceived and designed by a team led by Penn State Evan Pugh Professor Emeritus of Astronomy and Astrophysics Gordon Garmire. "This flaring source was a wonderful surprise bonus that we accidentally discovered in our efforts to explore the poorly understood realm of the ultra-faint X-ray universe," said Brandt. "We definitely `lucked out' with this find and now have an exciting new transient phenomenon to explore in future years." 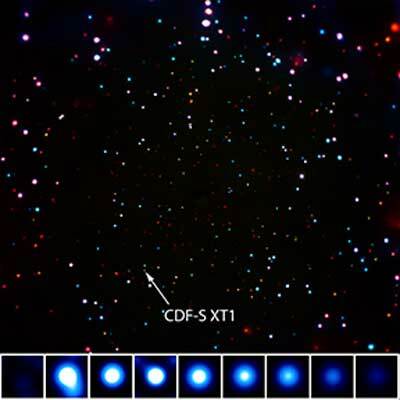 Located in a region of the sky known as the Chandra Deep Field-South (CDF-S), the X-ray source has remarkable properties. Prior to October 2014, this source was not detected in X-rays, but then it erupted and became at least a factor of 1,000 brighter in a few hours. After about a day, the source had faded completely below the sensitivity of Chandra. "Ever since discovering this source, we've been struggling to understand its origin," said Bauer. "It's like we have a jigsaw puzzle but we don't have all of the pieces." "None of these ideas fits the data perfectly," said co-author Ezequiel Treister, also of the Pontifical Catholic University, "but then again, we've rarely if ever seen any of the proposed possibilities in actual data, so we don't understand them well at all." This X-ray source in the CDF-S has different properties from the as yet unexplained variable X-ray sources discovered in the elliptical galaxies NGC 5128 and NGC 4636 by Jimmy Irwin of the University of Alabama and collaboratorsUniversity of Alabama and collaborators. In particular, the CDF-S source is likely associated with the complete destruction of a neutron star or white dwarf, and is roughly 100,000 times more luminous in X-rays. 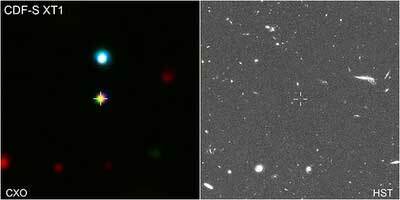 It is also located in a much smaller and younger host galaxy, and is only detected during a single, several-hour burst. "We may have observed a completely new type of cataclysmic event," said co-author Kevin Schawinski, of ETH Zurich in Switzerland. "Whatever it is, a lot more observations are needed to work out what we're seeing." Additional highly targeted searches through the Chandra archive and those of ESA's XMM-Newton and NASA's Swift satellite may uncover more examples of this type of variable object that have until now gone unnoticed. Future X-ray observations by Chandra and other X-ray observatories such as the planned Chinese Einstein Probe also may reveal the same phenomenon from other objects. If the X-ray source was caused by a GRB triggered by the merger of neutron star with a black hole or another neutron star, then gravitational waves would also have been produced. . If such an event were to occur closer to Earth, it may be detectable with the Laser Interferometer Gravitational-Wave Observatory (LIGO).